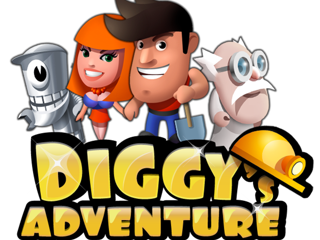 Start playing Diggy’s Adventure today - loved by millions of players around the world. Help Diggy search for hidden chambers and reveal well hidden mysteries of our past. Come on in - adventures await you from the moment you walk in our beautiful puzzle world! Dig through the hardest mysteries in this divine puzzle adventure to progress to the next level in hope of achieving that sweet feeling! Quick thinking and smart moves are rewarded with precious artefacts, special chests and tasty refreshment combos! Plan your moves by crushing the tiles and solving the puzzles in order to overcome those extra sticky levels! Unlocking ever more chapters in the exciting story along the way! What are you waiting for? Make yourself at home! ● Unique gameplay: help Diggy finish quests from gods and become the greatest adventurer! ● Exciting puzzle levels: tons of fun, featuring unique riddles and brain teaser combinations! ● A huge, beautiful locations: explore the whole world and discover all the secrets it holds! ● Special levels: play hundreds of levels with more added in regular updates and limited time events. ● Journey that never ends: there's no riddle that can't be solved! Diggy’s Adventure is completely free to play, but there are optional in-app purchases available. Either way, you’ll have a blast! Visit https://care.pxfd.co/diggysadventure if you need help from our caring community managers! Have fun playing Diggy’s Adventure - the puzzle and adventure game that never ends! The game cheats on energy! Very good but! Latest update did something wrong because i see “sand glass” before every map. It wont load. I have to close the game and begin again. Sometimes its help sometimes not. The game is very good, but I installed the latest update after not play the game.